What are goods and services? Economic or scarce goods and services are items generated through economic activities in order to meet a need or a desire. They are traded in the market and their prices are determined by supply and demand. Usually to a greater supply the price of the good decreases and to a greater demand it increases. Thus the exchange of goods and services is given at a price that is mutually beneficial to both parties (seller and buyer). Goods are produced in the primary or secondary sector. While Services, in general, are part of the economic activity of the tertiary sector. Services are considered intangible goods, that is, the non-material equivalent of a good. They are also considered heterogeneous, thus two services will never be the same. Some examples of services are education, banking, insurance, health, communications, transportation, security, and others are offered. Consumer goods: transformed for final consumption and bought and used by consumers. Intermediate goods: inputs used by companies to produce consumer or final goods. Capital goods: means of production of finished products. Normal good: if the price rises or income decreases, then the quantity demanded decreases. Most of the goods are normal. Inferior good: if the price rises or income rises, then the quantity demanded decreases (public transport, cheap food). Giffen good: if the price goes down or income rises, then the quantity demanded decreases (theoretical). Types of Goods and services according to their nature. Pure public good: non-rival, the consumption of one person does not affect others, and non-excludable, the consumption can not be prevented. For example public-access television, national defense, and fireworks. Common pool good: non-excludable, but consumption is rival. For example public swimming pools, water, and parks. Club good: excludable, but non-rival. For example golf courses, cinemas, and stadiums. 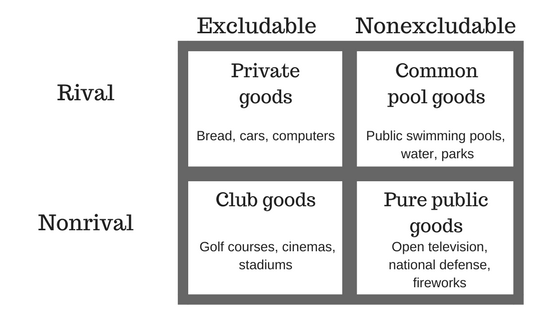 Private good: the opposite of public goods, excludable and rival. For example bread, cars, computers, telephones, and clothes. 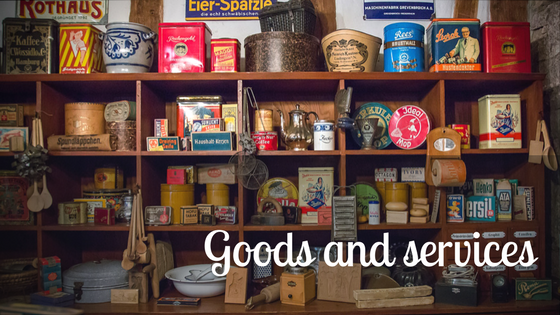 Economic or scarce goods and services are items generated through economic activities in order to meet a need or a desire. Normal good, inferior good and giffen good. Pure public good, common pool good, club good and private good.